I LOVE reality TV. LOVE. Yes, it’s true. I’m not ashamed to admit it. I watch Jersey Shore, Keeping Up with the Kardashians and Top Chef with the best of them. Which is why I’m so super excited about this week’s Friday Fave. Because this week’s Friday Fave represents the joining of two of my absolute favorite things in the whole wide world: reality TV and home design. Oh yeah, and it’s a two-for-one kind of deal too. Season 6 of Design Star premieres on Monday (July 11th) and I could not be more excited since it’s absolutely one of my favorite summer reality tv shows. I’ve been waiting all summer for this show to begin! If you’re new to Design Star, it’s a reality TV competition on HGTV (Home & Garden Television) which features aspiring designers competing for a shot at their very own design show on HGTV. Nothing like having your ultimate dream job on the line to stir up some reality TV competition, huh? The designers are usually a pretty eclectic bunch of people with a variety of design styles, backgrounds and experience but unlike some reality shows, Design Star actually has a pretty good record of finding stars for their network with at least 3 of the 5 previous winners currently hosting shows. Last season was a bit of a mess with all the “how does this musical instrument make you feel” challenges but I have a good feeling about this season thanks to all the changes they’re making. There’s a new production company in-charge which will hopefully equal less drama, more design, there’s a new host and they’re bringing back season one winner David Bromstad, host of Color Splash and one of my favorite winners, to serve as a Tim Gunn-esque mentor to the designers. It’s shaping up to be a fun season! Emily Henderson won Design Star last season and while the season was a bit of miss, she most definitely was not. 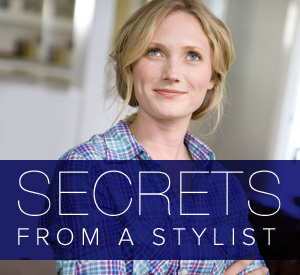 Her show Secrets From a Stylist has quickly become one of my favorite HGTV design shows. Even though she and I have very different design styles, I love the eclectic vibe she brings to her rooms, the bold choices she makes and the way she pulls everything together. Her show is totally different from any other show on HGTV which is exactly why I love it. Season 2 of Secrets From a Stylist premieres this Saturday and I’m definitely excited to see what she has in store for season 2. The format is supposed to be changing up a bit to allow for more style tips which I for one am really excited about. Oh yeah, and just to make her a little bit more awesome, she even has a blog where she shares a real and rather hilarious behind-the-scenes view of her show. Who says summer tv has to be boring? If you haven’t checked out Design Star or Secrets From a Stylist before, get those DVRs ready because home design TV goodness is about to begin. They both have the Nettio stamp of approval, haha. No DVR? You can watch full episodes on HGTV.com. Friday Faves is a regular series here on the ol’ blog where I chat a little bit more about my favorite things that appear on my Faves layouts. You can see more of my Friday Faves posts here. I don’t get perked for any of these posts. I’m just a fan. Happy Friday everyone! And happy July as well! Can you believe 2011 is half-over already? Craziness! I’ve been busy busy this week getting my scrapbook on (which is something that happens all too rarely around here lately) so for today’s Friday Faves post, I am reposting a post I did for the Sweet Shoppe blog a few weeks back, documenting my top five faves from our trip to New York City. Normally I would never consider reposting a post I’ve posted on another blog but in this case I’m making an exception since this post included a bunch of details from our trip to NYC that I want to include as part of my Adventure to Album album so I wanted to make sure everything was documented on my own blog as well so I can easily find them later. Soooo if you already saw this post over at the Sweet Shoppe, my apologies, and if you haven’t checked out the 365 Days of Bliss blog we’ve got going on over at the Sweet Shoppe, I highly recommend you do since it’s a great way to see what are amazing team of designers and Babes are up to over there. One of my absolute favorite things in the world to do is travel. Earlier this month I was lucky enough to take my first ever trip to New York City. Of course, being a city girl at heart, I had high expectations for the Big Apple and I have to say, I was NOT disappointed. I loved loved loved our week spent in NYC! My only disappointment was having to come home! LOL! Since we’d be here all day if I were to list everything I loved about this trip, I’ve decided to whittle our nine-day trip down into my top five favorite things, in no particular order. Of course, I will be creating a June 2011 Faves: the NYC Edition scrapbooking layout as part of my 2011 Faves series but since I haven’t started my page yet, some words and some photos will have to for now. Ready? Ok. Being huge fans of both Avenue Q and South Park (random fact: the nickname Nettio was actually inspired by an episode of South Park, haha), we knew if we were going to see one Broadway show, we wanted it to be this one. Given all the glowing reviews we’d seen beforehand, it was fair to say we had some pretty high expectations for this show. Did it live up to our expectations? Absolutely. We LOVED it! Adam even went so far as to say it was his favorite show ever (beating out some of our other faves like The Lion King, Avenue Q and Hairspray). It was THAT good. 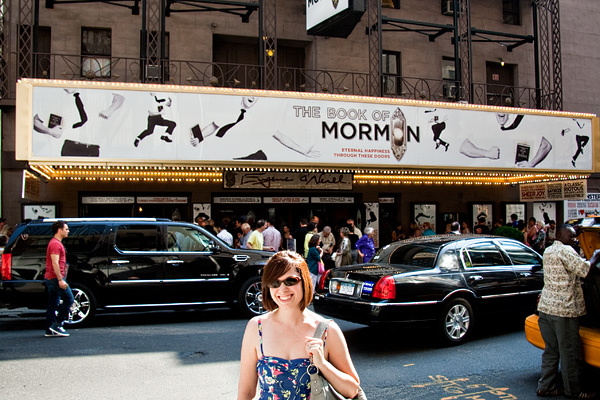 The songs were SO funny and catchy, the choreography for the Mormon characters was spot on (if you’ve ever been to a Mormon teen dance, you’ll know what I’m talking about, haha) and the overall message was surprisingly sweet. It was everything a well-done musical should be with a modern day twist. We both left the theater saying how much we wished we could see it again. It was definitely a hit in our book. Another random fact about me? I LOVE trees. So much so that when I was looking for a university to attend, one of my top requirements was that the campus had to have trees. No puny trees tucked in between big concrete buildings. Big luscious foresty trees. So it’s probably no surprise when I say that Central Park is pretty close to my idea of heaven. It was GORGEOUS. Lots of big, green, pretty trees. I was in LOVE. What was even more amazing was just how quiet the park was. Even though you could see the streets and cars through the trees, you couldn’t hear them. It was quite literally like being in a forest in the middle of a giant city – probably because that’s exactly what it is, haha. By far the biggest surprise was just how BIG the park was. Adam and I took one of those bicycle tours through the park where they show you all the major landmarks and movie locations and even so, we saw maybe half of the park? Central Park was such a fave in our book that we even made time on a second day just to go down and hang out in the grass and relax. It was a perfect balance to the hustle and bustle of the rest of the trip. It firmly solidified that if we ever set down roots somewhere it is going to be some place with lots of parks. And big trees. 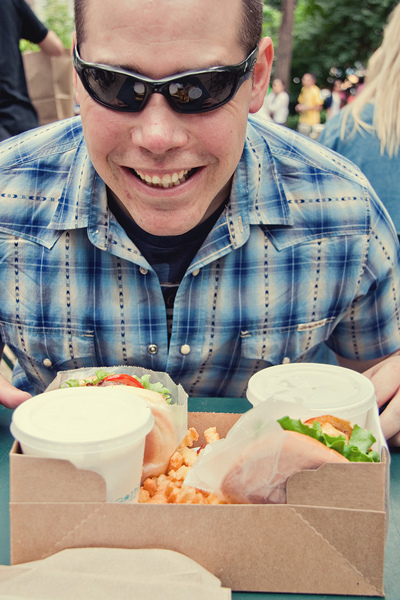 Food is always a big part of our travel itineraries and this trip was no different. Over the course of nine-days we had a pretty wide variety of foods: italian, NY-style pizza, doughnuts at Doughnut Plant, hot dogs, bbq, cupcakes, cookies from Levain Bakery – the list goes on and on. We’d even gone on a super healthy eating plan for the weeks before we left just so we could be sure we wouldn’t come back weighing 800 lbs, haha. As I liked to refer to it we were “making room” for our NYC trip, LOL! 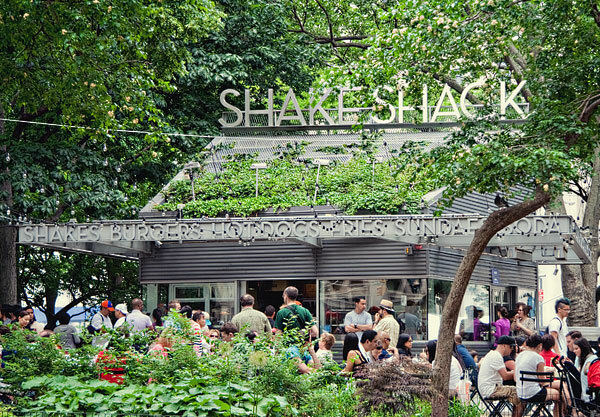 My personal favorite food experience would have to be lunch at Shake Shack in Madison Square Park. I had heard about Shake Shack many of times from Kelly Purkey’s blog and as a California-native where In-N-Out is king I was super curious to see what all the fuss was about. We had of course heard about the long lines which always make me a bit hesitant since sometimes long lines can equal overrated. I know it looks like Adam is really annoyed in this photo but really he’s just wanting food. The line went all the way around the corner! After waiting about an hour for food – 45 minutes to order and another 15-20 minutes while they cooked it – I have to say I was really impressed! The burgers were really fresh and juicy and the fries, shake and fresh lemonade were tasty. Adam’s comment was we waited an hour for food that took us 6 minutes to eat, haha, but that it was worth it. 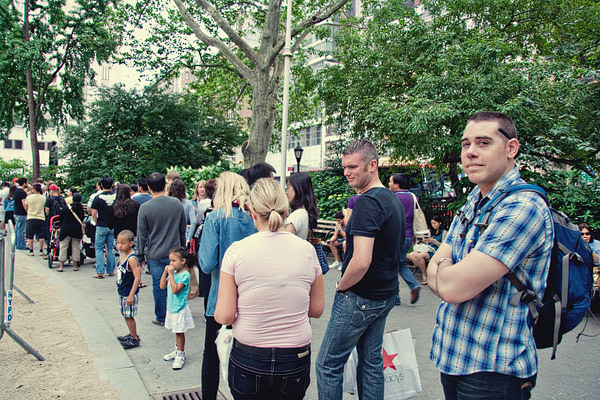 I’d even wait in that line again! See, he looks much happier now that he has food! Not to mention the location simply can’t be beat. Sitting in a park setting under the trees (see, trees! haha) eating tasty treats in the middle of the city is my idea of a good time. Despite the title, this fave has nothing to do with Snooki, Pauly D or the rest of the Jersey Shore crew, haha. 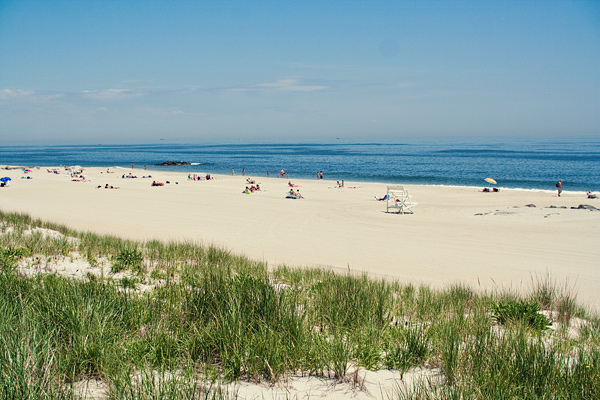 But we did actually spend the day over at the Jersey Shore for another reason – family. Adam’s cousin Christine leaves on the Jersey Shore so we took the train over from the city to spend the day with her and her family. Although we’d seen her in February at Adam’s grandmother’s funeral, we hadn’t seen the rest of her family since our wedding back in 2005 and to be honest, as most wedding days are, it was a bit of a blur. So it was really nice to be able to visit with them in a more relaxed environment. We took a stroll down the beach where I was able to put my feet into the Atlantic Ocean…for the very first time! And they gave us a nice tour of the area since this is the area where Adam’s mom’s side of the family is originally from before they all moved out to the West Coast. All in all, it was a really nice relaxing change of pace from the rest of the trip and I’m definitely glad we were able to fit visiting them into our trip. Seeing family is always a fave of mine! 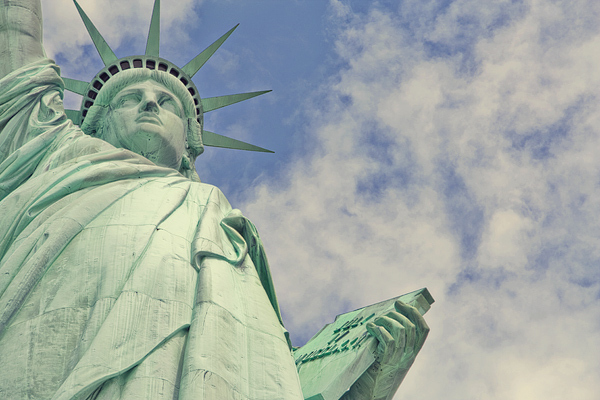 I’m happy to say the Statue of Liberty very much lived up to what I had imagined in my head. If anything it actually seemed bigger in person than I expected! Since we had heard the security lines at the Statue of Liberty can get really long (the National Parks Service website warns 90+ minute lines are commonplace), we decided to arrive in time to catch the 8am ferry in hopes of beating the crowds. I have to say, this totally worked! We waited only about 10-15 minutes to get on the ferry AND we were able to score some tickets to the pedestal of the Statue despite the website saying they were sold out. Yay for being early birds! The Statue of Liberty was definitely a cool experience but my personal favorite part of the day was visiting Ellis Island. Some of my dad’s side of the family came through there from the Azores Islands so it was really neat to be somewhere that had a personal history connection to my own family. One big advantage of having a really uncommon last name? When you find someone with that name in the database, odds are they’re related to you somehow, haha. As part of Ellis Island there, is the American Immigrant Wall of Honor where you can pay to have the names of family members who immigrated to America added to the wall. 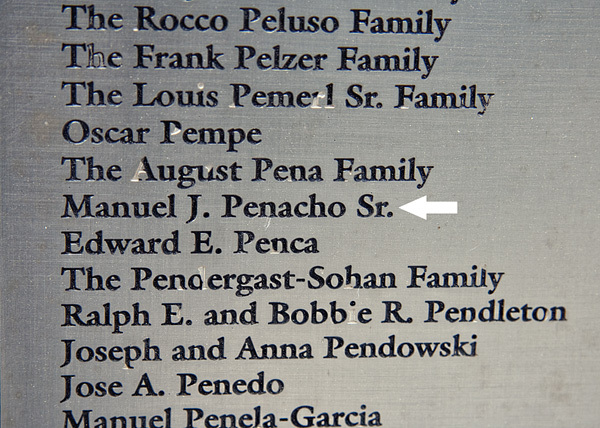 I had no idea before I went but turns out my great grandfather’s name was actually on the wall. So neat! Visiting Ellis Island was definitely highlight of our trip. As a scrapbooker it really made me want to learn more about my family history. Looks like I have another project to add to my list! And that’s it for my top five faves from my first trip to NYC. Anyone else ever been to New York City? What were your personal faves from your visit? Feel free to share in the comments! Happy Friday everyone! Welcome to another edition of Friday Faves! New to Friday Faves? You can read more about my Faves project and see all my previous Friday Faves here. If you listened to my guest stint on episode 49 of the Paperclipping Digi Show a couple of weeks ago, you’ll have already heard me talk a little bit about today’s Friday Fave since I chose it as my Pick of the Week. But I knew I wanted to give it a Faves post of it’s very own so I could share a bit more about my experience because it is definitely a new Fave of mine. 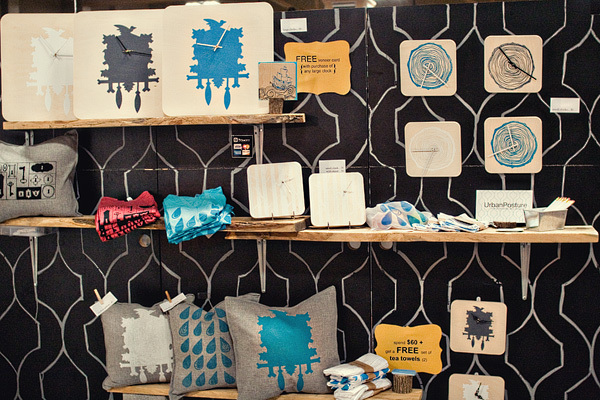 If you haven’t heard of the Renegade Craft Fair before it’s basically a free-to-attend craft fair that focuses on DIY and indie-craft culture, ie: handmade goods. 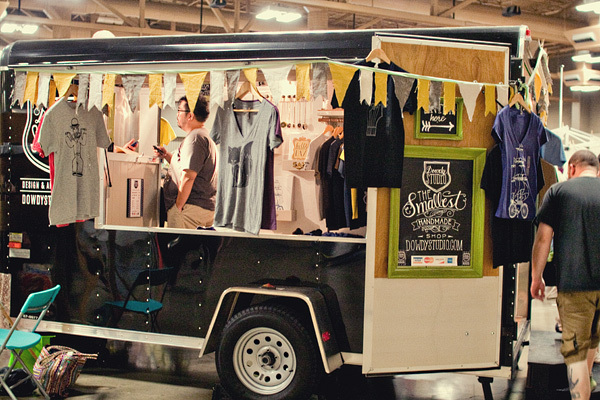 Think Etsy meets cool local craft fair. The fair is held yearly (with sometimes a second event for Christmas shopping) in DIY-craft friendly urban cities like San Francisco, New York, Chicago, Los Angeles, London (UK) and Austin which is the one one I attended. About time something cool came to this part of Texas! The Austin Renegade Craft Fair was the weekend before my birthday so I told Adam that I wanted to go and anything I bought could be counted as birthday gifts. Since it meant less birthday shopping for him, he was all for it! LOL! 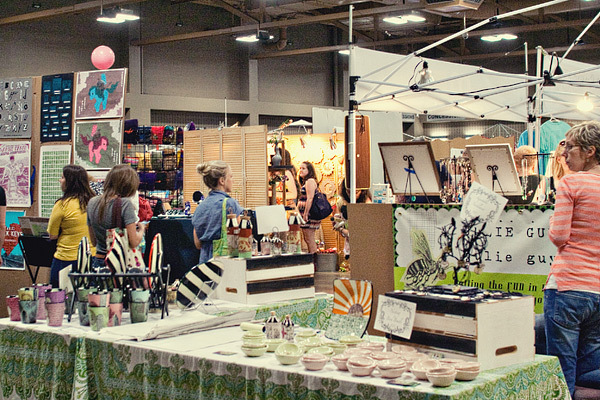 The fair was held at the Palmer Events Center in downtown Austin (yay for indoors in Texas heat). There were around 180 booths, some of which had multiple artists sharing the same booth. There were supposed to be something like 200 artists total at the fair. It’s kind of hard to tell in this photo but it was actually pretty busy on Saturday when we went. The UrbanPosture booth was one of the first booths we saw AND one of my favorite displays of the day. This is actually the side of the booth and I loved how the bold, black graphic design really stood out as soon as you started walking down that row of booths. They also did a really good job of showcasing their variety of product without it being too overwhelming like some booths were. I ended up buying one of the small blue tree stump clocks (more on that later) so obviously their display worked on me! I also loved their take on the modern-day cuckoo clock. I could totally see that large grey cuckoo clock somewhere in my living or dining room. I’m a sucker for natural home accents so I loved these wood vases from BDJ Craft Works. They were a bit out of my budget that day but they seemed really solid and I loved the variation in the woods. Plus they’re made locally in Austin. These lasercut designs from MAKEatx were SO cool! It’s hard to tell from the photo but the white parts on the flowers were actually cut out with the colored paper behind it. They also had a bunch of really intricately cut pop-up cards, like this Bonsai tree, which were just amazing. I probably said “that is so cool” a million times while in this booth, haha. This booth by CircaCeramics was another fave of mine. 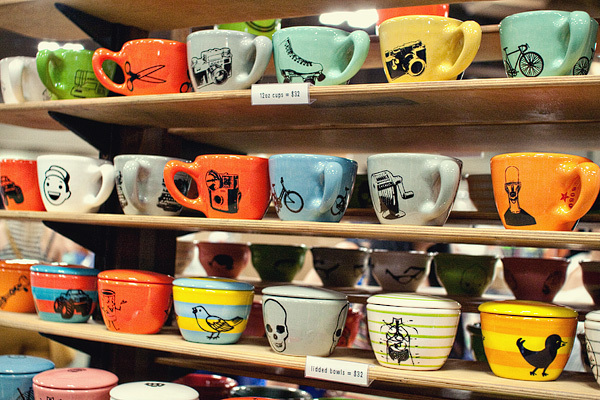 I loved all the brightly colored pottery with the bold graphic designs on them. I really wanted to get one of these small dishes with the bike on it (being UC Davis grads, we have a soft spot for bikes) to use as a dish for Adam to put his keys and wallet in, but I couldn’t decide on the color combination I wanted. But the great thing about this event is a lot of the artists also have Etsy/online shops as well, so I still might end up getting one of these eventually. They were really neat! This booth from Dowdy Studio was totally awesome. The Smallest Handmade Shop indeed! In case you’re wondering if Adam was hating life because he had to spend his Saturday at a craft fair, haha, I can assure you he was not. Not only was he a great sport about the whole event but he even offered to carry all the goodies we bought so I’d be free to look around. He’s one awesome hubby for sure. 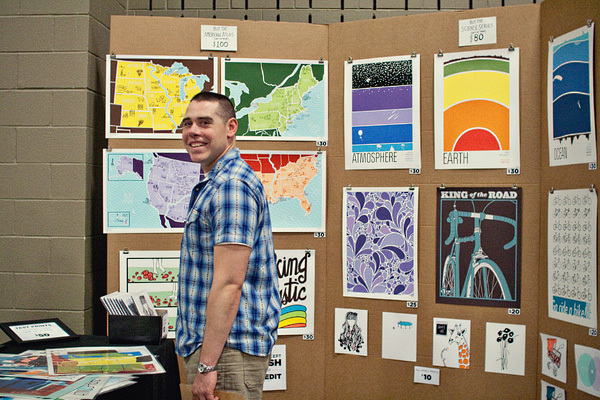 See look, he’s even smiling while checking out the Brainstorm Print + Design booth! Since we’re both from the West (me: CA, him: CA & ID), we ended up purchasing their fun Western US print which you can see just below Adam’s chin. We also loved their cool science-y art posters but buying all three wasn’t in our budget and we didn’t think it made sense to buy just one. But I love the whole science meets cool graphic art twist of those prints. They’d be really fun artwork for a classroom! We didn’t buy the t-shirt version seen in this picture but we did buy the little 3×5 card version you can see on the left side of the photo. It makes me giggle every time I see it! So, so far I have casually mentioned three of the items we picked up at the craft fair. Want to see all the goodies we took home? All together we picked up eight items for under $180. I thought that was pretty good! I loved her colorful graphic take on flowers. She had a lot of fun prints like this – it was tough to choose just one! The colors in this one finally won me over though. So happy and colorful. I love it! 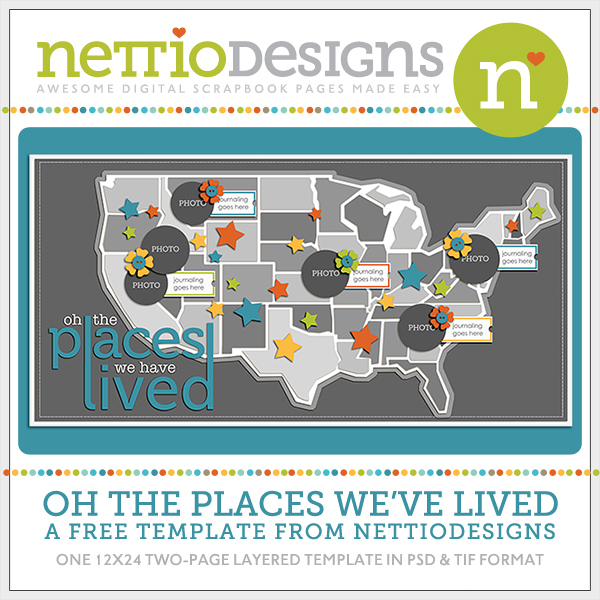 As I mentioned earlier in the post we picked up this print as an ode to our western US roots. 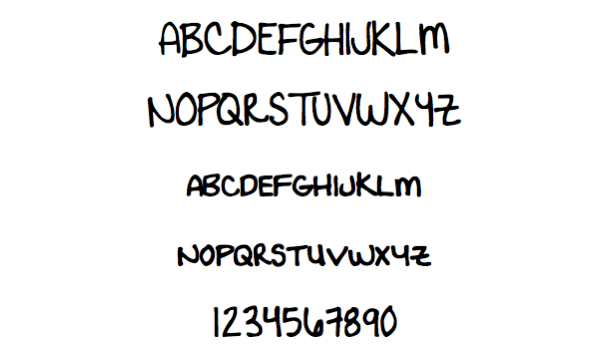 I love the little doodle-y touches on it. 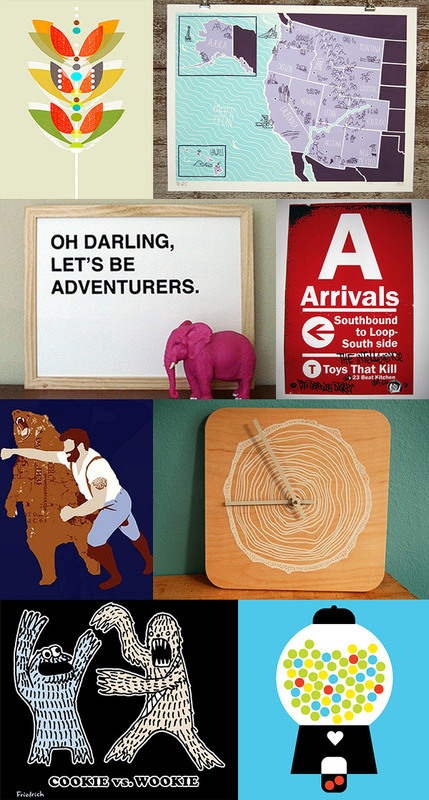 As part of my Operation Home Sweet Home project, I’ve slowly been collecting artwork to use as part of an adventure-centric gallery wall for our house. The message on this print seemed perfect for this! The text on mine is actually a pretty peacock blue rather than black. And no, the pink elephant was not included, haha. Adam chose this poster for his gaming/music room. Adam was really excited about this shirt. As he put it “it doesn’t get more manly than a man punching a bear.” LOL! 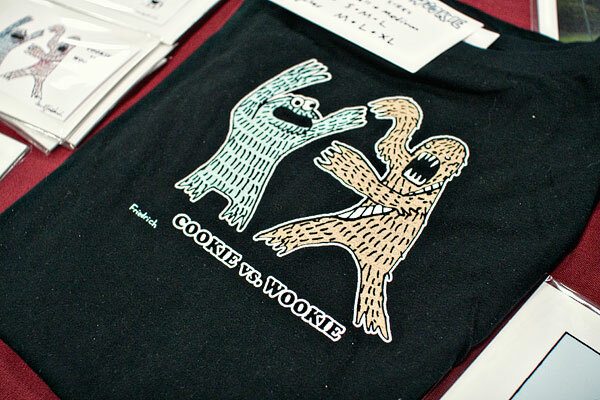 They also had shirts with a diver punching a shark and some other awesomely hilarious designs. As I mentioned earlier in the post, I picked up one of these tree ring clocks in blue for my office. It’s really cute and a perfect mix of nature meets modern design that I love so much. This is a picture of the shirt version but mine is a little 3×5 card with a white background with the same drawing. I plan to frame it and include it as part of a wall gallery – kind of like a hidden where’s waldo item in the midst of more normal photos and prints, haha. Another card I picked up that I plan to frame. 5×7 cards make for great cheap art! All told, we had a really great time at the Renegade Craft Fair! It was definitely a fun way to spend a Saturday! I’m always a big proponent of budgeting not only because it forces you to make smarter purchasing decisions, but because at an event full of amazing eye-candy like this one, it would be easy to spend several hundred dollars without even realizing it! 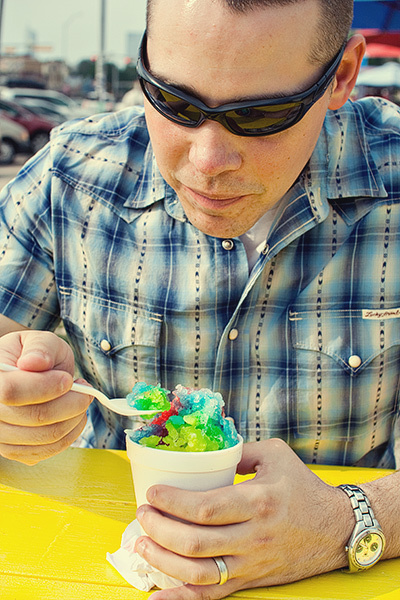 Avoid the after-event money guilt by deciding before you go what your max spending amount will be. We took cash out before we went to the fair which was really smart not only because we didn’t have to worry about which vendors were cash-only, but because it forced us to decide which items would get us the most bang for our budgeting buck. On our first trip around the room, we soaked up all of the amazingness and made a mental note of any of the products/booths we loved and wanted to come back to. After we had a chance to see everything all the booths had to offer, we took a little break away from all craziness and chatted about what our favorite items were. Then we went back for a second time to the booths we knew we wanted to purchase from. The great thing about this system was: a) it relieved that “what if I find something better” anxiety, especially since we had a limited budget and b) it kept us from having to carry bags around all day. One of the great things about the Renegade Craft Fair was that a lot of the vendors at the event also have online shops which means even if something isn’t in your budget to purchase that day, you can always check out their online shop later. We didn’t realize this at first but most of the vendors we saw had some kind of business card/postcard you could pick up that included their online shop information. Picking up these cards as part of your first trip around the showroom floor would be a great way to keep track of which booths you want to return to later. 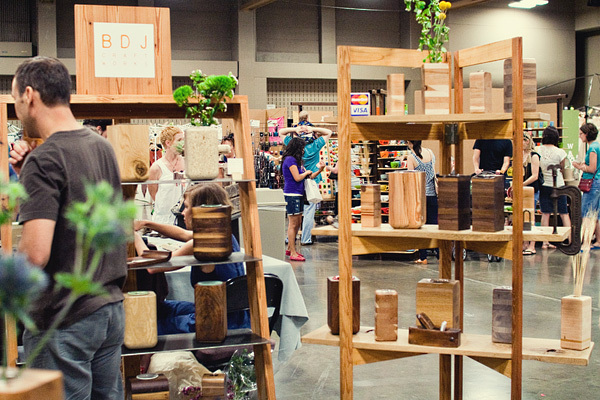 The Renegade Craft Fair also lists all the artists from the fairs on their website. You can check out all the Austin artists here. Maybe it’s just me, but I sometimes find large-scale crafty shopping events like these overwhelming because it can be tough to decide what you love and what you love enough to actually buy. But at the end of the day, it’s all good because no matter what you buy, you’re helping out another indie-craft type and that’s always a good thing. If you’re wondering how you too can get your hubby to attend an event like this with you, I highly recommend rewarding them afterward with a sweet treat. 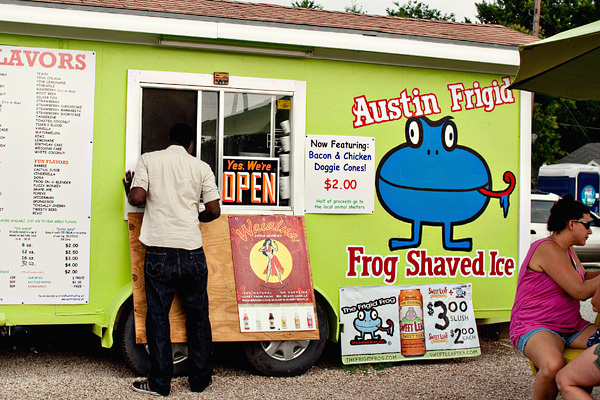 After the fair we stopped by one of our favorite Austin food carts, Frigid Frog for some shaved ice yumminess. See, a little sweet treat makes the day that much better, haha. 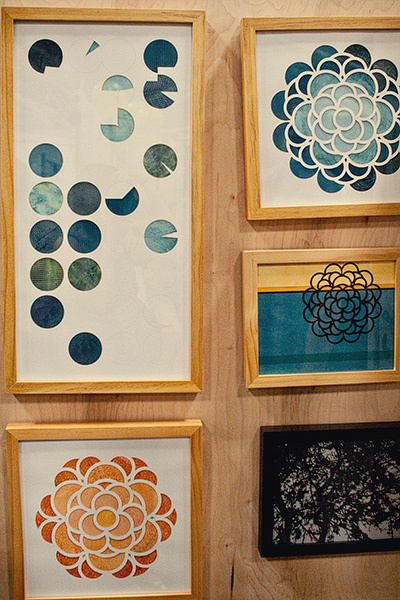 And with that, this Friday Faves post on the Renegade Craft Fair has come to an end. I have to say this event is definitely a new fave of mine and you can bet I’m already saving my pennies for the next one in November. Here’s to homemade Christmas gifts for all! 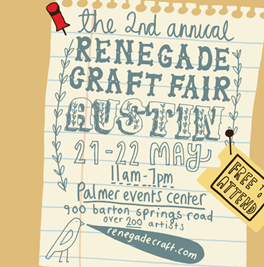 If you’d like to learn more about the Renegade Craft Fair, check out their website here. Anyone else ever been to the Renegade Craft Fair or an event similar to it? Got any craft fair tips to share? Let me know in the comments! Happy Friday everyone! Welcome to a very special edition of Friday Faves! While normally my Friday Faves posts are an opportunity for me to share a little bit more about some of my Faves that show up on my Faves layouts, today I wanted to share some of the fun things I am currently working on outside of NettioDesigns. Things have definitely been a bit quiet around here lately with my recent vacation and all, but I can assure things have definitely not been quiet behind the scenes! I’ve been a busy little bee! 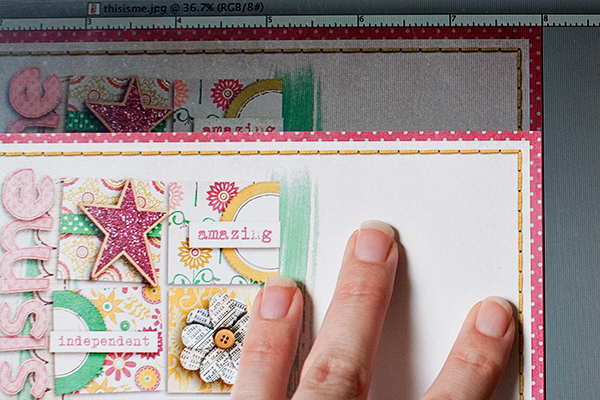 The day before we left for our trip to New York City, I was lucky enough to be a guest on episode 49 of the Paperclipping Digi Show talking about tips and tricks for making your digital pages look more like paper pages. We had a lively discussion about layering, shadowing and uh, wheelbarrows, haha, and I even shared some of my scrapbooking quirks that come from being a digi scrapper who didn’t come from a paper scrapbooking background. It’s a really fun episode and best of all it’s FREE so if you want to hear a little bit more about how my brain works when making my digi pages look like paper pages, check it out. 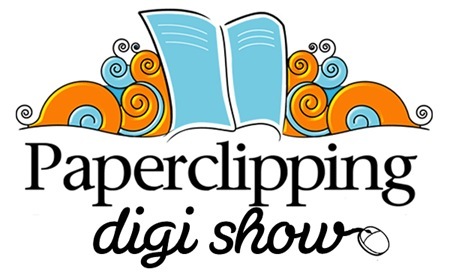 You can listen to the streaming version here on the Paperclipping website or an even better option is to subscribe to the Paperclipping Digi Show in iTunes here. Oh and if you enjoyed the show, would you go here and leave a little love in the comments? It lets the team know you appreciate all their hardwork and your comment may even get read on a future episode of the Paperclipping Digi Show! I mentioned this on the Paperclipping Digi Show but in case you haven’t heard yet, I’m excited to announce that the lovely and talented Debbie Hodge over at Masterful Scrapbooking Design has invited me to be one of their Guest Teachers for the July 2011 class. 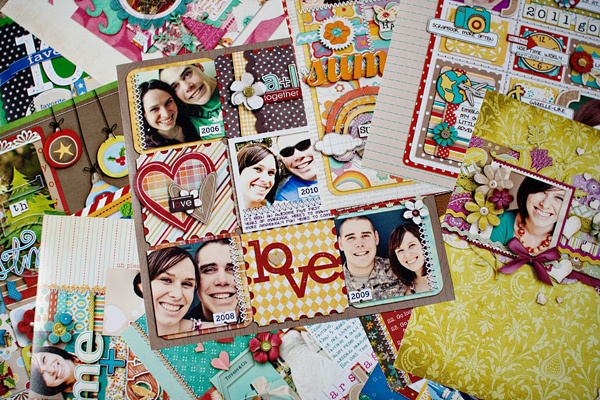 If you’re new to Masterful Scrapbooking Design, it’s a membership education site where each month there is a theme related to one aspect of scrapbooking design. Over the course of the month you get an in-depth seminar in both audio and PDF format, articles from the guest teachers, two big inspiration galleries and four webinars featuring each of the guest teachers – all for the amazingly low price of $12.50/month. 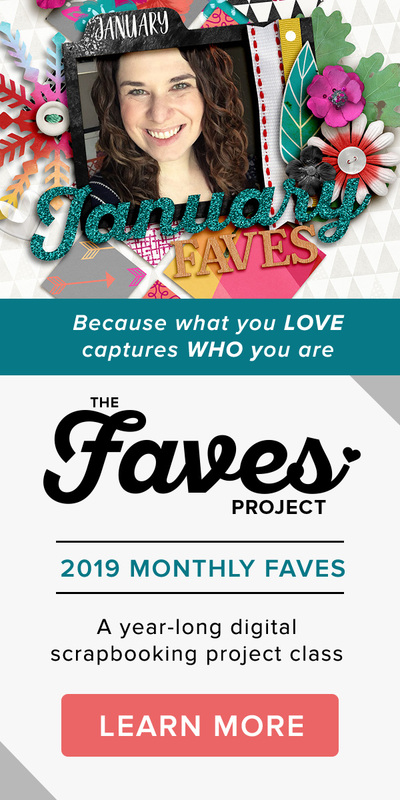 The theme for July is Fast Starts so we’re going to be talking all about ideas for speeding up your scrapbooking from organization to work habits to making smart choices about your design. I’ll admit when Debbie first told me about the topic, I was a bit nervous because speed scrapbooking isn’t really what I do. If you were hoping I’m going to reveal my secrets for creating my paper-lovin’ pages in under 30 minutes, I’m afraid you’ll be sadly disappointed, haha. 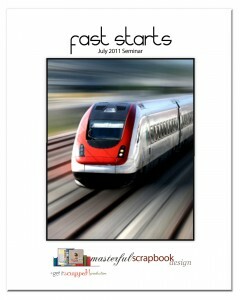 But I’m actually really excited about this class because it’s not so much about speed as it about smart scrapping. 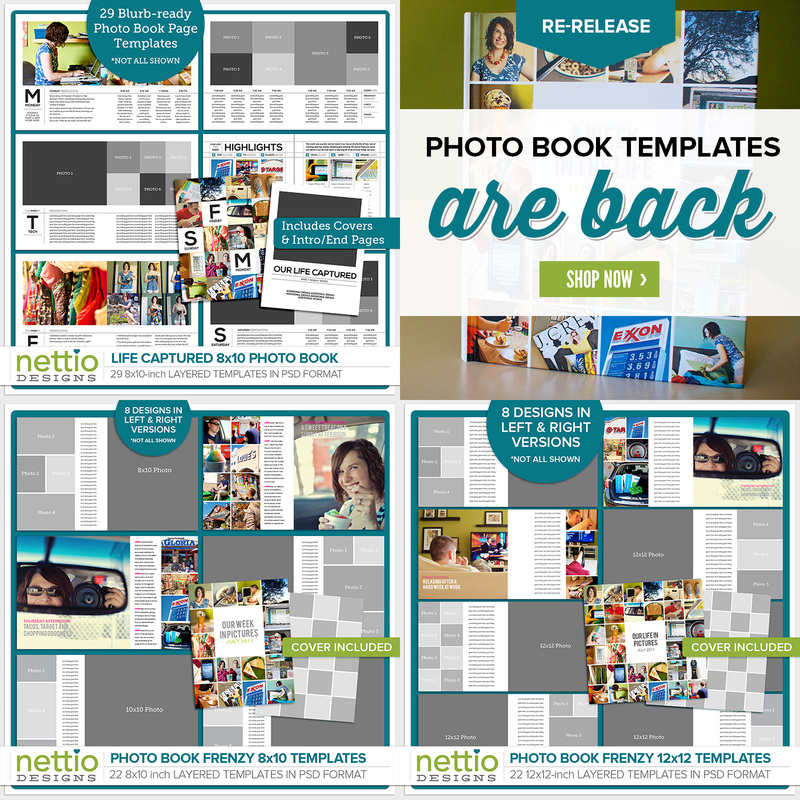 Looking for ways to approach your scrapbooking process in a smarter, more efficient way. And I am definitely ALL about that. I am always looking for ways I can speed up the parts of the scrapbooking process I don’t love so I can focus on the parts that I do. So while you won’t be getting any paper-lovin’ under 30 minute pages from me, what you will be getting is insight into the tricks I use on every scrapbooking page that help me to more efficiently create the layered, paper lovin’ I’m known for. Of course if my tips alone aren’t enough to sell you on the class, there are also three other fabulous guest teachers, including my fellow Sugarbabe, the amazingly talented Celeste, who I know will have awesome time-saving tips for you as well. Read more about the other guest teachers here. 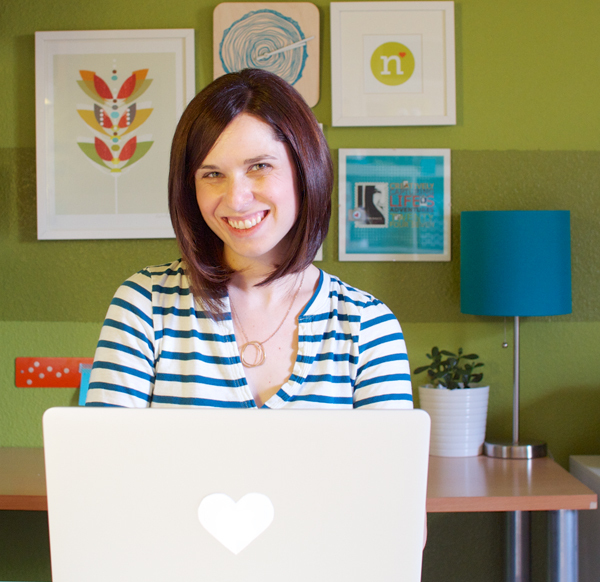 If you’re one of those scrapbookers who put time management and/or design as something you struggle with, I highly highly recommend you go sign up for the July class. At $12.50 it’s an absolute steal. You didn’t really think I’d do a Friday Faves post without any including any faves did you? Today I am guest blogging over on the Sweet Shoppe Designs blog as part of our 365 Days of Bliss and I’m sharing my top five favorite things from our recent trip to New York City. Go check it out here on the Sweet Shoppe blog! And that’s it for this edition of Friday Faves! Anyone have any exciting weekend plans? Adam’s had a LONG week at work, including several 4am to 8pm days so while I’m hoping for some fun adventures this weekend, it’s entirely possible I’ll just be hanging out while he sleeps. LOL!